This tour sold has SOLD OUT. The battle of Beersheba took place on 31 October 1917 as part of the wider British offensive collectively known as the third Battle of Gaza. The final phase of this all day battle was the famous mounted charge of the 4th Light Horse Brigade. Commencing at dusk, members of the brigade stormed through the Turkish defences and seized the strategic town of Beersheba. The capture of Beersheba enabled British Empire forces to break the Ottoman line near Gaza on 7 November and continue the advance into Palestine. In October 2017, Boronia Travel Centre is giving you the opportunity to revisit and understand this significant battle, and the wider Australian Light Horse campaign in Palestine. The fully escorted tour, led by our expert battlefield guide, Rod Margetts, will include the official centenary commemoration of the Beersheba battle, as well as visits to the sites of other Light Horse actions of the campaign. For further reading about the Light Horse please refer to Rod’s blog: The Australian Imperial Force’s (AIF) Neglected Arm. Your tour will begin and end in Tel Aviv, with a spectacular farewell dinner planned for our tour participants. As well as significant military history events, the tour also includes visits to major historical sites such as Megiddo and Masada and biblical locations on the Sea of Galilee. The unique range of activities and the venues have been carefully selected to enable you to experience the best local cuisine and the historical charm of the areas visited. This exclusive battlefield tour is strictly limited in capacity and is expected to sell out with only a few places remaining. Also, due to popular demand we have put together an Egypt and Jordan Pre Tour including visits to Cairo, the El Alamein battlefields and Petra, Jordan. Please contact Boronia Travel centre for more information. Visit the ANZAC Memorial near Kibbutz Beeri from the Third Battle of Gaza. Visit Tel Sheba – a UNESCO World Heritage site. Participate in the commemorative services at the Beersheba War Cemetery, the official opening of the ANZAC museum, a ceremony at the Turkish War Memorial, a ceremony at the Australian Soldiers Park, a parade down Beersheba’s main street and a re-enactment of the Light Horse Charge from the Tel Sheba overlook. Float in the hypersaline water of the Dead Sea, the lowest point on earth. Visit Masada, Herod’s famous mountaintop fortress where the Romans defeated the Jewish revolt. Learn about the Battle of Abu Tellul between the 1st Australian Light Horse Brigade and the attacking German force. Visit to Nabi Samwil – a strategic outpost overlooking Jerusalem. Visit Mount Scopus and the panoramic overview of the Dome of the Rock, on the platform of the Temple Mount. Visit the War Cemetery and memorial to ANZAC soldiers and Old City’s Jaffa Gate. Guided walking tour through the alleys and byways of the Old City, including the Holy Sepulchre, the Egyptian Labor Corps, the Western (Wailing) Wall, and the Jewish Quarter. Visit the town of Bethlehem and the Church of the Nativity and Manger Square. 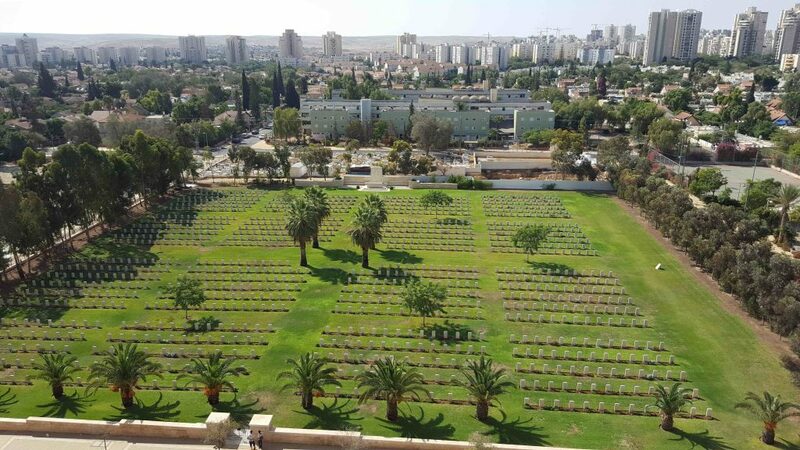 Visit the Ramleh Commonwealth War Graves Commission Cemetery, the largest cemetery for Commonwealth forces in Israel. Follow in the footsteps of General Allenby’s Megiddo Offensive in Galilee. Visit Stella Maris, site of Elijah’s cave in Haffa, and the British War cemetery. See the Basilica of the Annunciation in Nazareth, the largest church in the Middle East. Learn about Galilee’s strategic and historical importance. Travel up to the Mount of Beatitudes, the site of the Sermon the Mount, where we will get an overview of the Sea of Galilee and the Golan Heights. Fully escorted by Boronia Travel Centre battlefield specialist and Australian Military Historian: Rod Margetts. All battlefield excursions, scenic drives and sightseeing as described in the itinerary. The opportunity to visit other places of personal interest in the area. The best available accommodation in each town or city. Plenty of Free Time. We understand that you might want to have a break occasionally. Services of a local english speaking guide throughout your tour. Ground transport in deluxe air-conditioned coaches with toilet. Boronia Travel Centre cap, ticket wallet and luggage tags. With the exclusive resources available, Rod Margetts may be able to assist with any family research you may be doing. Please note: There are no single supplements offered for the second coach due to limited accommodation available. Boronia Travel Centre uses Singapore Airlines, Cathay Pacific and Emirates for all their Western Front Tours, and has access to the most competitive discounted airfares available from Australia. Group airfare add-on options available upon request. Upgrade airfares to business and first class available upon request. Spend more time in Israel with one of our accommodation packages available at discounted rates. “I want to thank you for the exceptional tour I did with Rod Margetts and the other three tourists. We had the most wonderful tour because the guides, Rod and Sinan were so patient, knowledgeable and enthusiastic and we four felt that the tour was personal and tailored just for us. We cannot speak too highly of our guides. Rod and Sinan made sure that the tour was loaded with interest and information, and very enjoyable. Although we were such a small group yet we got the best presentation possible. The way Rod and Sinan worked together was amazing – you would swear it was fully scripted!! There was no doubt that they enjoy working together, and mutually provided flexibility with the programme showing they had the specific interests of the 4 of us in the group. Didn’t matter whether it was Istanbul or the battlefields, they both covered the interesting and relevant parts so well. This included our visit to Shrapnel Valley Cemetery a second time to place flowers at my Uncle’s grave. Rod made sure the two “girls” in the group found the headstones etc which were of specific interest to them. We obviously could not take all the information in but what we did assimilate is food for further reading and understanding. By covering the main aspects fully they gave us a sound overview and the basis to look at other material, which we will do. Rod, I knew you were a good instructor 35 years ago, but you have taken it to a new level. I had done a lot of reading leading up to the tour, but information overload, inability to relate it to ground and my faulty memory meant that I was having trouble putting it in context (to the extent that I recognised the relevance behind all your daily questions, but couldn’t remember any of the answers). Over a week you put all of that information and feeling for the ground into context in a measured, logical, informed and interesting way. I had wondered how those in the group who might not have been so committed to military history would remain engaged, so for me the proof of your approach was their enthusiasm throughout. The detail of your descriptions and ability to answer questions from left field with your broader understanding was simply outstanding. I re-read Sniffy’s book on the plane on the way home as a good summary of the first couple of days and it all makes sense now. (Actually, better to say I understand it now, as the whole affair certainly didn’t make sense). Thank you. We had the trip of a lifetime, with the help of Rod Margetts, and Sinan (Our Turkish Guide) the Gallipoli trip was absolutely amazing, Rod explained everything in a way everyone in the group understood, my husband and I had the wonderful opportunity of laying a wreath for our Anzac at the Lone Pine Centenary Commemoration, which was televised and recorded by our family at home, a once in a lifetime opportunity. We also attended the Centenary “Smoking Ceremony” for our Indigenous Soldiers, also another once in a lifetime experience. Rod’s guidance throughout out Gallipoli experience was absolutely fantastic, and Sinan gave us the cultural and the Turkish version of events. I don’t believe there was anything left out.